Response to the federal Government’s Our Land Our Languages inquiry into Indigenous languages. Why Warriors has always advocated that working with Yolŋu people in their own languages is the most efficient way for Yolŋu people to receive effective education, training and information towards their own empowerment. 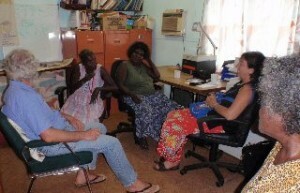 For this reason we require all our resource workers to learn to speak Yolngu Matha. This might seem like a no-brainer to many people, but almost all of the education, training and information delivered to Yolŋu people today is in English. English is still a very foreign language for Yolŋu people and many other Aboriginal people, requiring them to do the hard communication work all the time. It is great to see that the federal Government’s inquiry has reaffirmed this importance of supporting Indigenous languages for both successful educational outcomes for Aboriginal children and to effectively close the gap. If this report is now implemented, we might see some real gains instead of more wasted government dollars and wasted Yolŋu lives. Some of the committee’s findings included that “the key to developing competency in Standard Australian English was for the child to be taught bilingually, with the first language used as the basis for learning in the earliest years.” After 4 years of the ‘English Only’ policy from the former NT Labor Government, this one statement is a welcome return to common sense. It also means that the last surviving bilingual schools in the NT, Galiwinku, Yirrkala and Areyonga, might have some relief coming provided the new NT Government listens. The committee also makes the recommendations that the Government “resource bilingual school education programs for Indigenous communities”, use “alternative NAPLAN methods and reporting for students whose first language is not English”, “develop a national framework of flexible and accessible training for indigenous people to gain limited authority qualifications”, and make “compulsory EAL/D (English as an Alternative Language/ Dialect) training for all teaching degrees and mandatory EAL/D and cultural awareness training for teachers working in Indigenous communities.”This report has even linked the positive “contributions of Indigenous languages to Closing the Gap”. We have known all along that people can only be empowered when they understand the information and communications that are directed at them. And the only way Aboriginal people like the Yolŋu people are going to understand all the important information that they want and need to access to in the world they now have to survive in is through their own language. This is something that the Australian media, the ‘interventionists’ and many others in the dominant culture seem to miss all the time. The Our Land Our Languages report has now reconfirmed it again. We have long advocated that Indigenous people should have access to learning English through radio programs, something that still has not happened. The committee received 154 submissions from across the country and held more than 24 public hearings. This has been a real win for the cause. Now we need to work and see if we can get the findings implemented – this is a real cause to fight for. See no.37 for the submission from Why Warriors and the AHED Project and no.84 for the submission from Richard Trudgen.